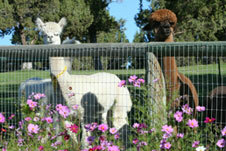 We invite you to come "walk on the moon" with us to admire and acquire the alpacas of your choice. While you're here (depending on the time of year) you'll be able to experience world class snow skiing, or fly fishing or golf. You can also take a walk through the Cascades or enjoy a trail ride. This is huge horse country! Or, if shopping is your niche, how about a day in the Old West town of Sisters? We are accessible by car or plane. The regional airport (RDM) here in Redmond, receives flights from several major hubs throughout the day including Seattle, Portland, L.A., Salt Lake City and San Francisco. Driving instructions are listed below. 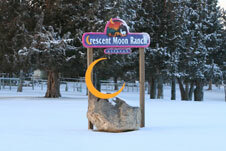 Crescent Moon Ranch is located 1/2 hour north of Bend and 3 hours Southeast of Portland. The physical address is 7566 N Hwy 97, Terrebonne, Oregon 97760. Our phone number is 541-923-2285.